THE TAKE HOME: Women are designed to be more sensitive to the environment so they can pass vital information about the environment to their germ cells and future offspring to set their epigenetic programs. This implies they are more sensitive to native EMF’s by having lower levels of myelination in their CNS/PNS. This means that women during their fertility spurt in life are aging faster, and time on a relative basis, time is actually sped up for them. Is menopause a way to recapture this lost time? So how is this aging process slowed down for them as their life evolves? Menopause is nature’s catch up program to gain time by augmenting the grounding effect in their blood plasma. How does this occur? Massively lowering their estrogen in a short time scale allows women to recapture magnetic flux from the sun via their blood using iron as an intermediate. Fertile women can put the brakes on this process with breast feeding because it also lowers their estrogen levels. This blog is not about fertile ladies but those in menopause. This process augments the magnetic flux and quantum yield of sunlight in the blood by energizing the blood plasma as a magnetohydrodynamic fluid. And if you follow the advice a mineralogist/food guru who has only “half of the story” correct, and forgets to understand why nature is driving iron higher you get a false belief that iron and ferritin are bad for women in menopause. Why? If you do not understand the Faraday effect with respect to sunlight you’ll continue a false belief paradigm. Faraday in 1845, showed that light passing through a material will have its polarization rotated by the application of a magnetic field, a phenomenon known as Faraday rotation. When you go back and carefully read Faraday’s journals, as I have you’ll see something interesting in his observations. Faraday cited a number of other, earlier, experiments which seemed to predate his discovery of a deep relationship between light and magnetism, and it was these earlier experiments which flummoxxed me for a long time until I learned about spintronics and electrons. The first of these experiments was performed somewhere around 1812 by Professor Domenico Lino Morichini (also written Morrichini in google searchs) of Rome, Italy. You won’t find an original cite to his work but it is detailed in many other papers of the time period. Many other scientists have given detailed descriptions of his experiments. They were quite simple. Morichini reported to have magnetized iron just by illuminating it with violet light derived from sunlight! He got the UV light using one of Newton’s prisms in the experiment to separate out the light frequency from the others. So this should get you wondering how iron and ferritin works with UV light as a semiconductor in menopause. Ferritin carries and protects iron atoms inside of its paramagnetic shell to protect the ferromagnetic atomic iron inside of this shell from becoming magnetized and highly reactive. Once the iron atom is released by the UV stimulus from the skin’s irradiation it becomes a quantum dot semiconductor that is magnetized by UV light. If you go and read books on actinotherapy from the early 20th century you will find many reports backing up the Faraday effect and Dr. Morichini’s findings in the literature. Roger Coghill wrote about how red blood cells can become severely magnetized, which causes the RBC’s to act like myoglobin and hold on to its oxygen far too long to diminish oxygen delievery to cells. This adversely affects their oxygen carrying capability, and this stimulates the attraction of white blood cells in the plasma inhibiting the WBC’s to perform physiologically. This is why fevers are often associated with infection and overheating in the sun because any rise in temperature above 98.7 degrees heats up the blood, which demagnetizes the blood plasma allowing the RBC’s to release the magnetic flux to water in the blood to build the EZ. This rise in the EZ around RBC’s also will not allow clumping of RBC’s platelets, and WBC’s improving the rheology of viscosity of the blood to carry more oxygen more efficiently. 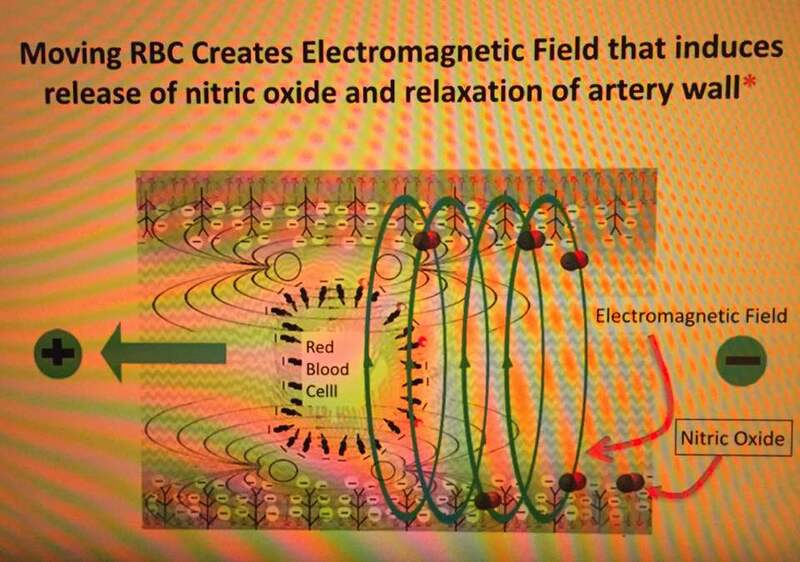 The movement of RBC’s in the arteries just below the surfaces of the skin also can induce electromagentic waves that can also release nitric oxide in blood vessels to lower BP and improve the rheology of blood by allowing hemoglobin and blood plasma to be irradiated by sunlight. S. Seneff 2016 provocative proprosal. 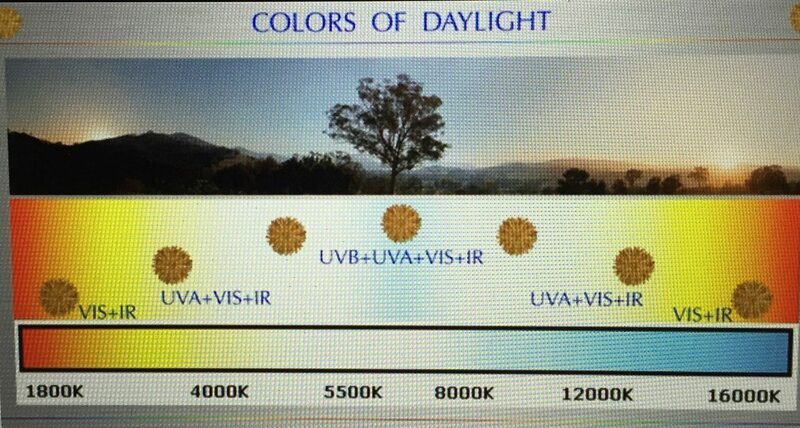 I mentioned in the past on my FB page and website, a 1927 study that showed that UV light exposure can raise venous oxygen. This is one of the main mechanisms that my friend Jeremy Thomley has used to be able to breath through his skin with his cystic fibrosis. UV light exposure on the skin effectively magnetizes and then de-magnetized iron based upon the surface and blood temperatures. This is why cold thermogenesis and UV light exposure are one of the better ways to create your own hyper-baric oxygen chambers in a natural mito-hack. UV light magnetizes iron and changes its atomic lattice slightly by vibration or temperature variations to create a cycle of increase oxygen deliver to mitochondria. UV light is capable of magnetizing and simultaneously de-magnetizing blood by using temperature and percussion to make or destroy solitons that affect the magnetic effects in blood. This effect should not surprise physicists or biologist but it does when they hear it. They did not beleive it when I mentioned in a medical meeting ten years ago. Then I told them about two mito-hacks I used to proved the Faraday effect can do some things we do not appreciate. So how do you do this mito-hack yourself? Just get some tools that are made up of an iron alloy. People believe only what they see. Faraday showed that iron is not really solid in his experiments. The atoms are capable of moving slightly in a metallic lattice. In fact, when you buy tools made of iron alloys the metal atoms are not fully in alignment. 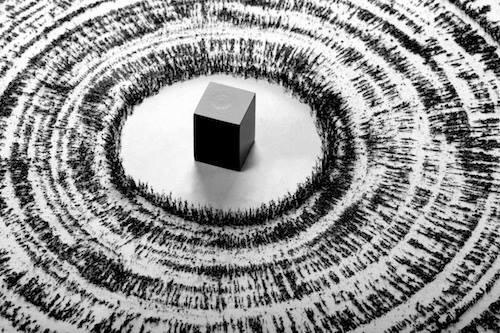 Magnetic science teaches us that the better atoms align atomically, the more magnetic a metal alloy becomes. So I decided to mito-hack this effect using tools and the Earth’s small magnetic field. All you need to do to convince yourself that this effect is real is lay the tools in a north to south orientation and strike them with some force with a hammer several times to create a shock wave. That shock wave cause a resonant wave generation which aligns the atoms better than their random assignment in the tool to increase their magnetic qualities. Mother Nature’s resonate hammer is UV light and the Schumann resonance of Earth. UV light has more kinetic energy than any other frequency of light therefore this is why Professor Domenico Lino Morichini found the effect in iron bars in 1812. The resonant waves act stochastically to perform molecular surgery on the iron’s atoms to move slightly more into alignment with each other using the aid of the earth’s magnetic field as a guide. Menopause is a time when a woman needs more sun light, not less sunlight as her physicians often tell her. At menopause a women is losing energy from the “wave part” of sunlight and she is using iron and UV light to use the particle aspect of light to harvest more magnetic energy from the sun’s rays naturally to gain much more energy back than she lost in the process of menopause. So how does the body attempt to remedy this process? Iron is an essential trace element that is used to form molecules in the body, such as hemoglobin. Ferritin is the major storage protein for iron. Free iron is toxic for human cells because of its reactivity with other redox chemicals but it can be used as a quantum dot in blood plasma to become transiently magnetized to collect the energy of magnetic flux and be converted to a DC electric current in the circulatory system. So what controls iron’s release from ferritin? Iron’s charge within the ferritin protein controls its release. Since iron is very reactive to sunlight because of its large amount of D shell electrons, iron has a higher “rate of emissivity” than other atoms in cells. This offers cells a very unique and obscure way to harvest energy using UV light, spintronics, and electron spin to do it. It turns out atoms with this ability radiate more energy than normally expected by biochemists. So this is why menopausal women have higher iron and ferritin levels present in the blood. It also explains why most modern women who go through menopause feel worse than their grandmothers did when they went through this process. Older women rarely do what nature expects her to do because of social and cultural convention. Does this Faraday effect do them any good when they are constantly covered and indoors and never go out into the sun? No, it does not. That is how a good evolutionary adaptation can go very bad. Sunlight’s effects on iron is transient and is designed to be a short term bridge to harvest this free source of energy to replace what women have lost via their tensegrity system, cell membranes, and collagen over the first 4 decades of their life. This is why modern women always complain they GAIN WEIGHT and often feel ill when they enter menopause. Iron and sunlight effect a women’s innate emissivity. When their emissivity is in the IR range of light (as it is in SUNLIGHT), the proteins containing iron seem to be more energized. Emission of light energy reflects the intensity of charge movement in a protein. Ferritin is a solar active protein. Sunlight wavelengths can change when light travels through the atomic material in a cell or in blood. This change in incident light frequency is called a Stokes shift. Ferritin is a paramagnetic protein, meaning it is drawn to menopausal mitochondria to excite electrons that enter electron chain transport. The reason for this is when sunlight energized blood plasma solar radiation drives the charge movement which generates new electromagnetic waves that can also generate other electromagnetic waves that change the charges in their local environment. This is incredibly important in a menopausal woman’s mitochondria where her 4th and 5th cytochrome all work better on IR light frequencies. Iron and ferritin can deliver this energy to her mitochondria, sans the need for food electrons. So if a woman does not get this sunlight boost how does her cells react? She has to eat more to provide more electrons to offset the light energy deficit. So when ferritin rises it is usually because people are not spending enough time in the sun. The body up-regulates ferritin production in this case awaiting its activation. Many people think that ferritin elevation is a sign of inflammation but it is actually a sign that these people live a solar spectral deficient life. A mineral specialist food guru will push you to pills and foods to fix a quantum problem. When you see how nature works you realize this will never solve the problems modern women have with menopause. If you lack sunlight, you have less electrons and more protons in your tissues and mitochondria. This will lower the pH and this decreases the size of exclusion zone (EZ) in water. The loss of the EZ will increase the distance between the respiratory proteins slowing quantum tunneling speeds of electrons and you will get every symptom in menopause women complain of. Mother nature uses sunlight to solve quantum problems and a quantum clinician should look to solve the problem the same way. So how could a modern scientist test this hypothesis I am raising here in this blog? 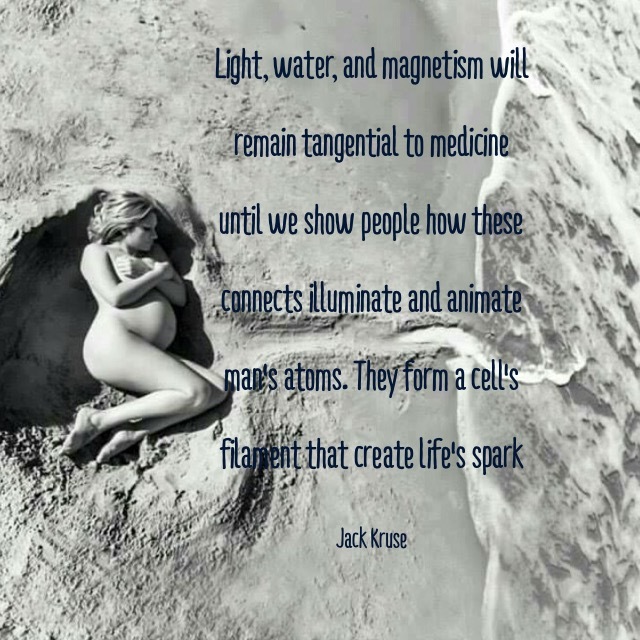 So how could a modern scientist prove that UV light has innate magnetic power that is unbelievable strong? You could use a compass needle made up of an iron alloy and the control group in the experiment should be made of another alloy. Both compasses would need to be kept at the same temperature. You could use the sun rays, but it might be wise to use anLED laser at 400-405 nm to observe the result. Most people in physics are all familiar with how a compass needle swings back and forth when one moves it, eventually settling on magnetic north. Samuel Hunter Christie, the inventor of a technique for measuring an unknown electrical resistance (today referred to inaccurately as the Wheatstone bridge). He also had a great interest in measurements of the Earth’s magnetic field. In an 1823 paper, Christie measured the strength of the Earth’s magnetic field relative to a pair of bar magnets using a magnetic compass needle. He noted, however, that the magnetic strength of the compass needle is dependent upon its temperature, so he set out to examine the behavior of his magnetic needle in different conditions. In Christie’s words from ( “On magnetic influence in the solar rays,” Phil. Trans. Roy. Soc. Lond. 116 (1826), 219) that this swinging disappears more rapidly (i.e. the motion of the needle is more damped) when in direct sunlight than when in the shade. This implies there is a deep photo-magnetic effect in solar light in addition to the photoelectric effect of the same rays of light. Most people would bet that the change in needle behavior is more temperature dependent, than due to the innate magnetic effects in UV light, but my own mito-hacks taught me something new. Most people link magnetism with the Curie temperature and coolness, but I have deep sense UV light makes things more magnetic transiently than cooler temperatures do. 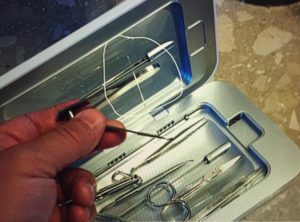 This mito-hack likely will show you whether through making it easier to induced magnetization by UV light in the needle or by thermal expansion, the key is both processes can alter the needle’s rotational inertia. That inertia can then effect the EZ of water in blood and be transmitted long distances in cells. When you understand the physics behind the experiment one can then apply the conservation of angular momentum and torque of the earth’s field on the magnetic dipole (EZ of water). If the sunlight is really causing the needle to magnetize, the needle will be increasingly torqued, so the period would be a changing variable in the experiment. I have a sense the that is exactly what iron and ferritin do in a woman’s blood during her life. The UV light alters the angular momentum of the iron and this directly impacts the EZ in her blood plasma. 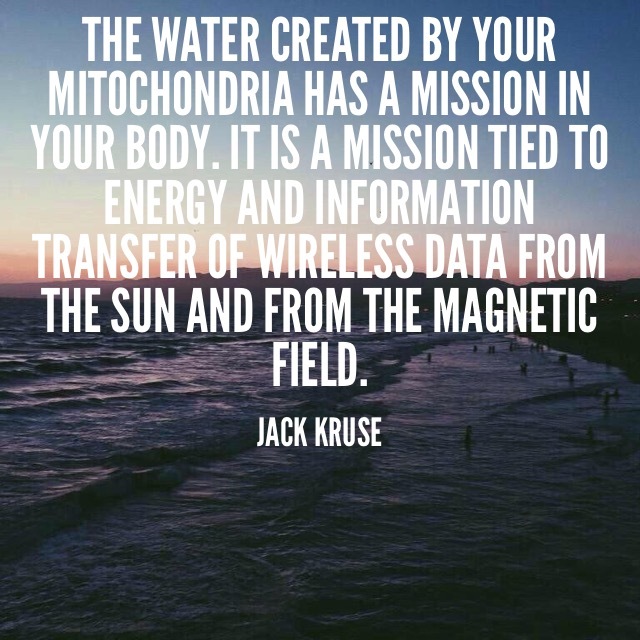 Because all humans live under the Earth’s magnetic field, the water molecules in the EZ of our blood plasma will sense this magnetic torque and transmit it to the ATPase in mitochondria improving energy flow in the electron chain. We could easily prove this by looking at the spin rates of the spinning head of the ATPase in menopausal women to see the quantum effect. This is easily testable idea in lab, but I don’t have the ability to do it as a physician. Maybe a researcher will read this and decide to prove my hypothesis wrong. I welcome that challenge. This mito-hack I have proposed should raise the question “what is the effect of polarization and partial diffraction on the photomagnetic effect on humans?” When you consider the atomic structure of hemoglobin especially with respect to porphyrin rings and planar fats with metal ions embedded in them something unusual might be expected based upon this paper in Nature. Mitochondrial charge separation can generate tremendous voltages per square inch across a thin 4-6 micron membrane. Wouldn’t it follow that there would be equally strong localized magnetic fields generated by this effect in mitochondria? It turns out according to calculations already madein QED, this effect is 100 million times stronger than expected. This opens the possibility that we are missing something big in physics in relation to UV light and possibly to the development of transient magnetic monopole generation. This is where topologic insulators become critical with respect to the Faraday effect. Light is an electromagnetic wave whose power varies with frequency, which means that it has two components – an electric field and a magnetic field. In the vacuum of space, the magnetic field is some eight orders of magnitude weaker than the electric field. Many people do not know this. It is almost so weak as to be considered negligible. When we realize biology is quantized even small effects can lead to massive amplifications because of non linear effects found in cells loaded with semiconductors. This is often why this magnetic effect is overlooked in menopause in my opinion. Once light enters a material, things change at atomic levels tremendously. These effects are far below our ability to measure it in medicine today, but absence of evidence is not absence of effect because physics knows these effects happen with respect to light and subatomic particles. When light is trapped in a medium/semicondutor, the electric field accelerates charges. Specifically electrons, begin to want to move in the direction of light because of the electric field. Physicists had thought that the magnetic field would affect the dynamics of the electrons only when they approach very high “relativistic” speeds, close to the speed of light. Domenico Lino Morichini, Faraday, and Christie’s experiments all should have pointed science to these possibilities, but their work has been largely unexplored. Linus Pauling was the only researcher in our recent past that I know that has tried to tackle this topic with his study of hemoglobin. I think Mother Nature uses these effects in RBC’s to build life and the dual reality that women face in life before and after menopause. Physicists have proven by experiment that when electrons are bound to their nuclei, as they are in insulators (think topologic insulators), the electric and magnetic dynamics of the electron become linked by QED laws, allowing energy to pass from electric to magnetic fields. The situation is different in semiconductors which allow electrons to move in their lattice which does not allow energy to pass from one to the other. The result is that when light shines on a topologic insulator, the magnetic field generated alone, can shift electrons in the direction of the light, creating a polarization of charge. This aspect of the Faraday effect with a topologic insulator is vastly ignored in bio-physics and biologic research. This effect acts much like an optical capacitor does in fiber optics, which can be tapped directly for electricity. Since cells are known to use a DC electric current to regenerate there is a huge area of science that needs to be studied. This action in tissues can create a DC electric current from magnetic flux perhaps at efficiencies of around 10% using the photo-magnetic effect. Certain topologic insulator materials, like hemoglobin, or free atoms have magnetic moments that are 100 million times stronger than formerly anticipated. Over 160 years ago, on November 8, 1845, Michael Faraday investigated the magnetic properties of dried blood and made a note “Must try recent fluid blood.” If he had determined the magnetic susceptibilities of arterial and venous blood in vivo, he would have found them to differ by a large amount. The difference is as much as twenty per cent for completely oxygenated and completely deoxygenated blood; this discovery without doubt would have excited much interest and would have influenced appreciably the course of research on blood and hemoglobin in biology. Linus Pauling’s experiments have found oxyhemoglobin and carbonmonoxyhemoglobin to contain no unpaired electrons. Unpaired electrons have different spins and different magnetic effects, as a result. This means that iron hemoglobin (human hemoglobin) contains four unpaired electrons per heme molecule. The carbon monoxyhemoglobin molecule was found to have zero magnetic moment by experiment, and hence, contains no unpaired electrons. The molecule of oxyhemoglobin, like that of carbonmonoxyhemoglobin, wass found to have zero magnetic moment and also contain no unpaired electrons. Why am I so sure I am correct about the innate ability of UV light to transiently magnetize things when the sun is out? About 8 years ago, I did a very counterintuitive mito-hack after reading a physics blog about Faraday’s experiments. I was trying to learn about the polarization of light and the optical effects on my own blood. This hack was where my ideas for the Quantlet first materialized. It helped me realize how humans might be able to use light frequencies and cold to add energy using light and sound waves by increasing magnetic flux into our blood. This small mito-hack eventually lead me, ten years later, into the formal development of the Quantlet with my partner Ruben Salinas. What did I do 8 years ago to satisfy my curiosity? I went out and bought a UV sanitizer to clean my cell phone. As I kept this device in my office I’ve used it to UV sanitize medical instruments I was using in my own hacks done on myself through out the years. Here is a picture of the device. I placed two previously unmagnetized syringe needles into it while bio-hacking blood work, and I quickly found out the needles had become magnetized when magnetic clip on my desk bound to the needles on my desk. 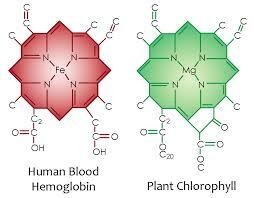 Inadvertently, this hack seemed to have explained to me why the blood of all animals uses iron hemoglobin and not magnesium chlorophyl that is found in plants. Early on in my re-education I had stumbled into another non linear effect of sunlight on the skin capable of magnetizing blood by transferring magnetic flux energy from the sun into our bodies in a very novel way. It augments the grounding effect seen in mammals outside the tropics. This is very important for people with un-coupled haplotypes and in those with Northern European ancestry. Time, and consciousness is built when we are awake. We lose track of time when we are asleep or anesthetized. 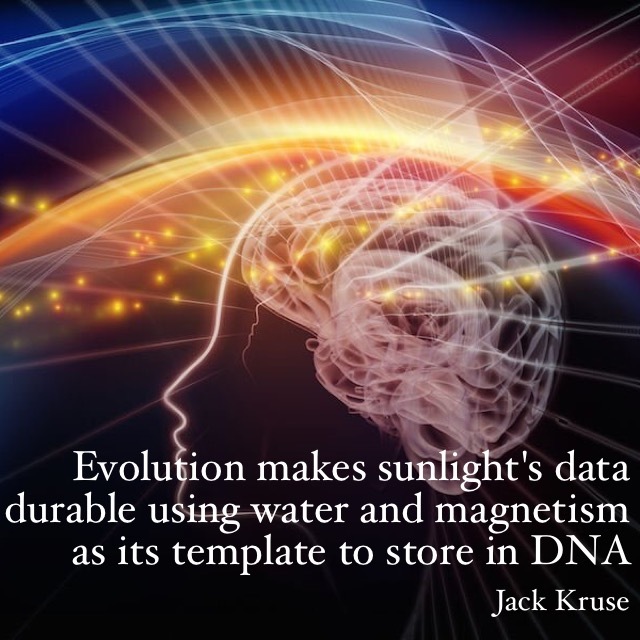 The presence of sunlight is key to both time perception and consciousness. I went deep into how I think consciousness manifests in my March 2017 webinar. Every object appears to have a definite position, a definite momentum, a definite measured value, and a definite time of occurrence in wakefulness. Is the same true in sleep? Why does every living thing sleep? Might the reason be so it cannot carefully observe the quantum state of life that occurs at night when it sleep fro diurnal animals? The reverse would be true for noctural animals. This one may surprise some who follow scientism and reductionism. In 1977, physicists E. C. G. Sudarshan and B. Misra studying quantum mechanics discovered that the dynamical evolution of motion of a non linear quantum system can be hindered and even inhibited through observation of the system. Since humans are non linear quantum beings, this maybe why our eyes and other senses will not allow our mind to sense these processes. Maybe cells are designed not to observe the smallest things that go on in our cells so that these processes can go on and work under the Zeno effect??? Maybe Mother Nature does not want us to see the most fundamental part of how life works, because if we did, life would never manifest and we would be in a chronic sleep state? I believe the arrow of time is created because sunlight disrupts cells by exciting their electrons in their atoms that make up their semiconductors in cells, slightly changing them. This small non linear change that we cannot perceive allows redox reactions to occur in biochemical pathways and this is a way of measuring the effects of a variable light frequencies as a day “ages” and impacts in cells in chronobiologic fashion. The presence of light destroys quantum processes that normally occur at night when magnetic flux is greater. Understanding the Zeno effect is why I have believed for 12 years that life’s primordial condition is sleep and as the sun’s light disrupted the processes on the ocean floor we slowly evolved wakefulness and consciousness. All things must sleep to maintain quantum coherence to use the non linear apsect of light during the dark. When we go out in nature, we are entering into the edges of the unknown world, to the fringes of knowledge, where everything seems mixed up and contradictory, illogical, and incoherent. Nature almost operates by combining chance with necessity, randomness with determinism to build reality. 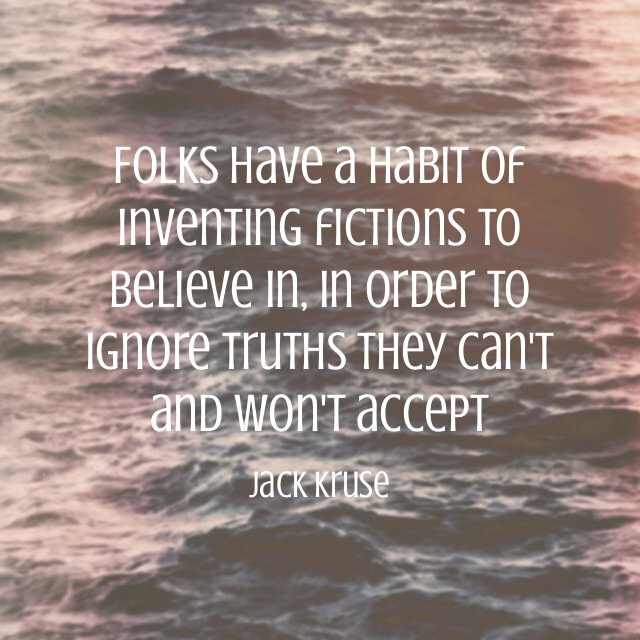 What research attempts to do is smooth out contradictions and makes things obseverable, simple, logical, and coherent. It assumes that nature can be known best in this way. Have you ever thought that maybe this assumption is where all science has gone wrong? Science never asks of itself might the way we study nature might lead us down a false path of reality? When nature joins things she builds things that have new qualities unknown when you reductively deconstruct the components. Whenever experiment separates these things our experiment loses ‘something”, and that “something” might be the most important part of the wisdom of nature. This materialism in the scientific method has become the language of modern science. It creates itself in ideas buried in theories to interpret reality disconnected from the “whole of things”. It is easy for those who conflate religion with science to interpret any criticism of reductionism as an ‘attack’ on their ‘faith’. The cynical today have become scientists who think they know the basis of everything, but in reality, they likely know the nature of nothing. This is why clinicians remain flummoxed about menopause and its best therapies. 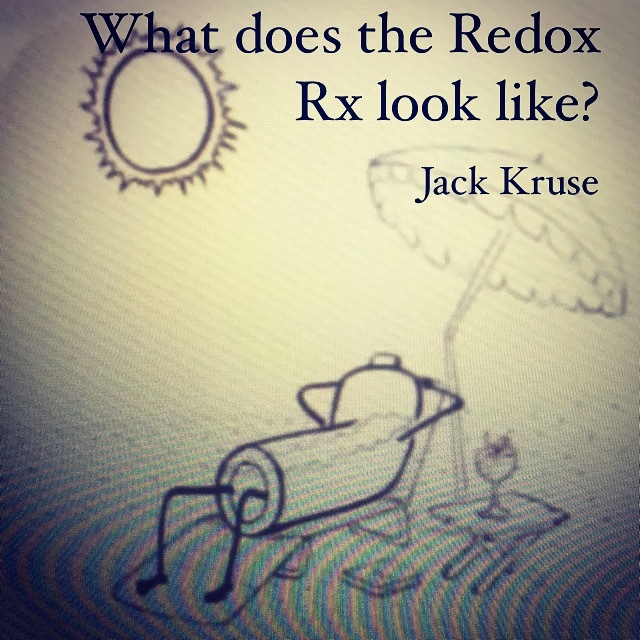 Symptom suppression is not healing, it is big business at work in healthcare. Dr. D. I. Macht ” The Influence of UV Irradiation on Menotoxin and Pernicious Anemia Toxin in 1927. Proceedures of the Society of Experimental biology and Medicine., 24:966-1927. Thank you! I suffer from hashimotos and pernicious anemia. Life became easier when I went through menopause and didn’t have so much iron deficiency! I was thankful for menopause. If was a blessing!